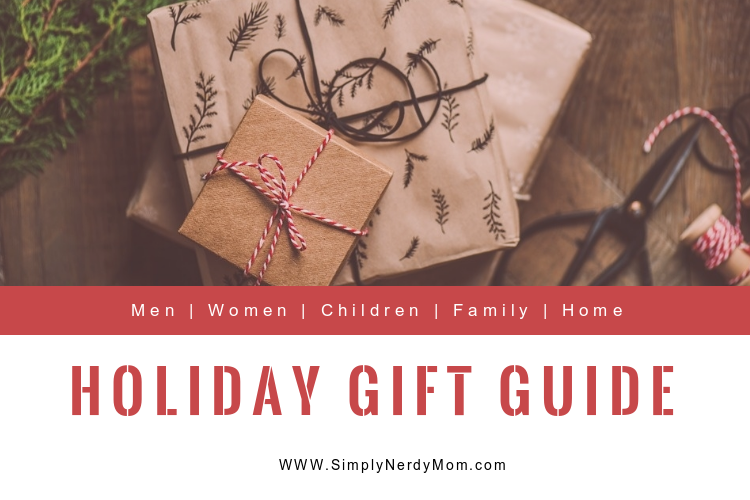 I'm a busy mom, so I'm all for quick and easy meals, especially ones my family loves and can't get enough of. This one is quick in that once it's prepared, it only takes a few minutes from cook time to table. This also happens to be one of those meals that you can prep the night before and just pull out of the fridge and start cooking as soon as you come home from work. 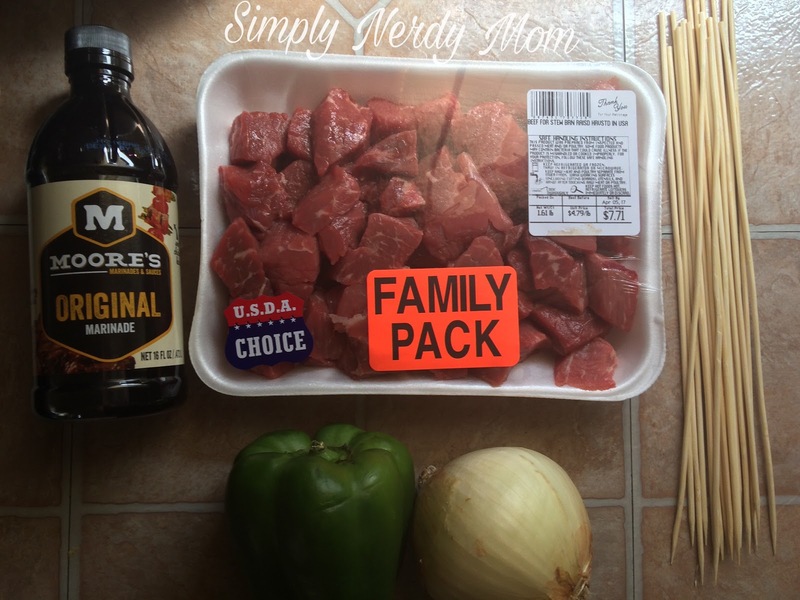 For my steak kabobs, I use a package of beef stew cubes, since they are already tender and cut perfectly, but I've also used other cuts of steak, it's really a matter of preference. This also goes for the veggies you use on your kabobs. I used a green pepper and onion. Sometimes I add mushrooms and/or tomatoes. Sometimes it's various different peppers. It's just either what I have on hand at the time, or what my family is hungry for. 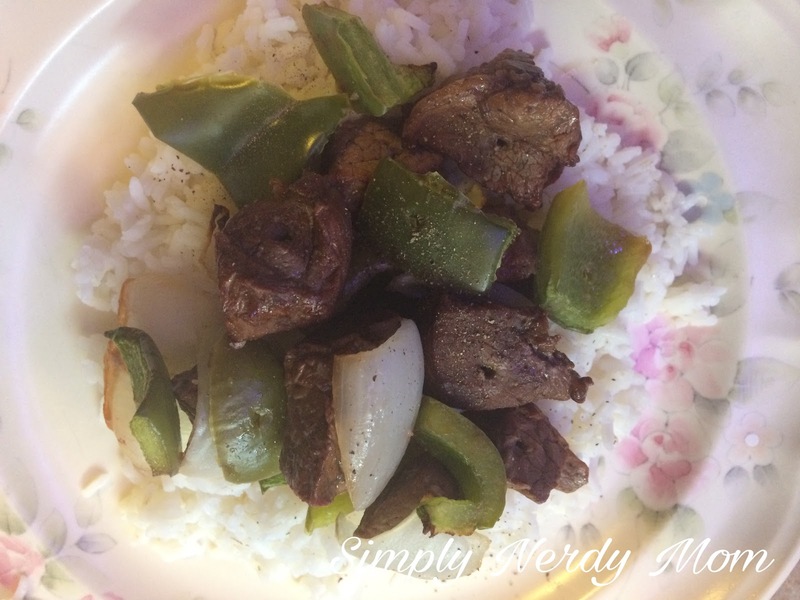 Since I paired these kabobs with white rice, I chose the pepper and onion route. I put my steak cubes into a Ziplock freezer bag and poured an entire bottle of Moore's Marinades Original Marinade in. Typically, for one package of cubed steak, you would only use about half the bottle, but I doubled the steak this time, so I used the whole bottle. I sealed the bag and stuck it in the fridge for an hour. You could leave it in overnight or only leave it in for 30 minutes. But I would leave it for at least 30 minutes to really get the flavors set. While my steak marinated in the fridge, I cut up my veggies, and soaked my wooden skewers in water. My mouth was watering the entire time because this marinade smells delicious, plus I was sampling the peppers as I cut them up. Surely I'm not the only one who noms on veggies as I cut them, right? Fresh veggies are so good! 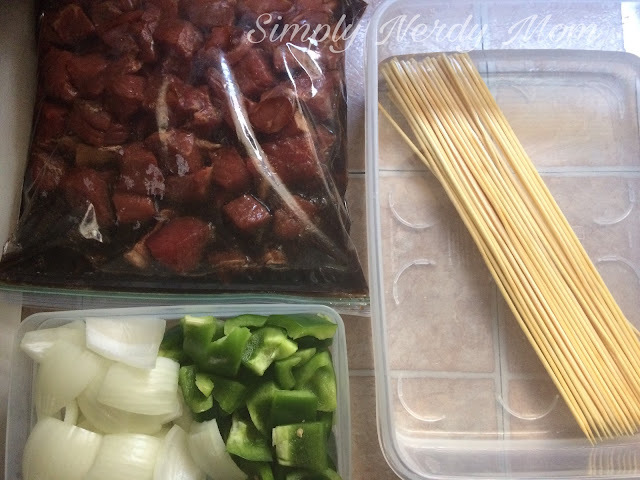 Once the steak marinaded long enough, I began skewering everything. That sounds vicious now that I re-read it, but I guess if you are having a bad day, skewering things might be therapeutic. Who am I to judge? 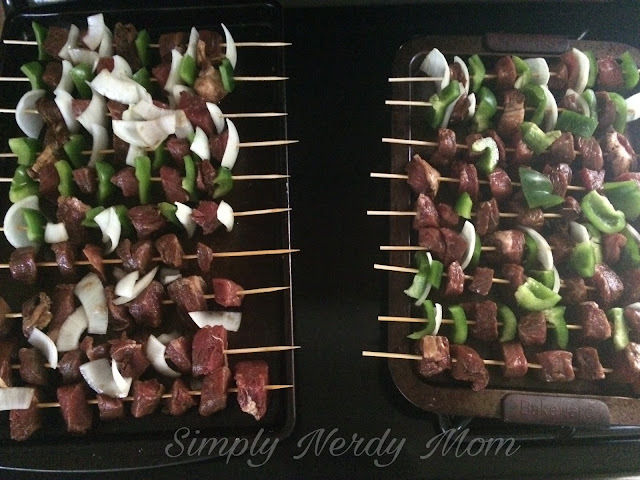 I made some with just steak, since my kiddos are really picky about veggies from day to day. I mean, one day they will love peppers, and the next day they are telling me they are "allergic" to them. They aren't allergic to anything, but that's their excuse for everything lately. My husband and I love veggies so I loaded ours up. When I had some peppers and onions left over and couldn't fit anymore onto the trays, I just scattered them on top of the kabobs for more flavor. Initially, I had intended to do these on our grill, because YUM! However, as usually the case come spring, we go out to start the grill and find out we are out of gas from the previous summer. Funny, because I was pretty sure we didn't grill all that often last summer. No matter, I just popped them in the oven at 350 degrees for 30 minutes. We actually enjoyed this way of cooking them because my baking sheets (which I've had forever honestly, and am way past needing new ones), caught the drippings from the steak and veggies and made a nice "sauce" that we spooned over our steak, veggies, and rice to bring the entire meal together. My family ate so much of this. I thought for sure we would have more leftovers which would have been even better the second day, after sitting in the juices, but they ate it all except a skewer or two. 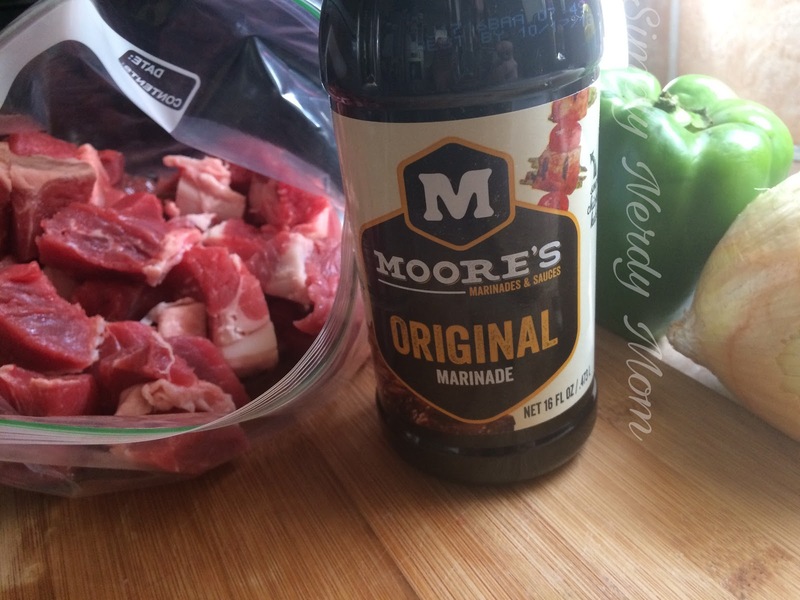 The Moore's Marinades Original Marinade is so good and our go-to when we marinade and grill any meat and veggies. 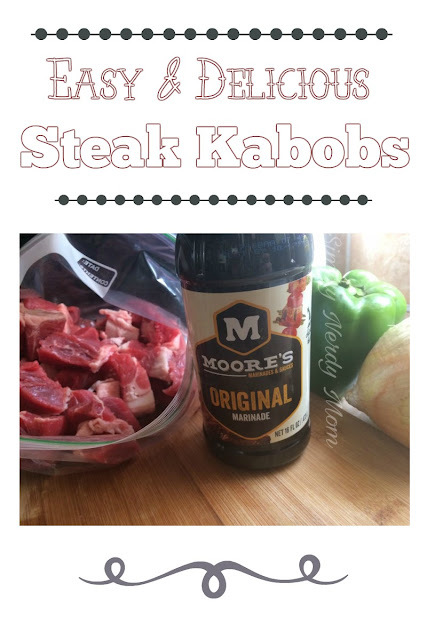 It makes great kabobs and even stir fries and this particular recipe is one we have often through out the year (not just grilling season).